This sacred sight atop the hills of Montmartre, France was photographed by yours truly almost 40 years ago during my first adventure abroad. It pleases me no end to find function for at least one of the many prints that have been so lovingly stored for all these years. I'm not sure where it goes from here, but if the Zendoll Workshop Etsy store get ever gets restocked, here's one little shadow box to get the proverbial ball rolling. How nice of you to visit during our Paris link party!!! 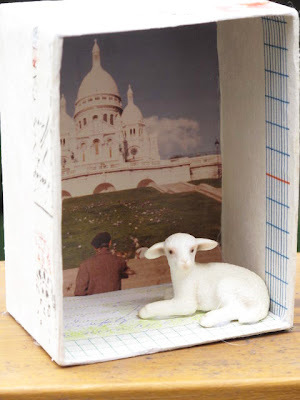 Sacré Coeur was my absolute favorite church when I was in France; seeing the representation of Christ when you walk in felt ALIVE TO ME, though I love all the history and art that makes up the other fine churches, basilicas and cathedrals.